This is a painting that St. Therese finished in 1892, when she was 19, and gave to her sister Celine. The Act of Contrition: O my God! 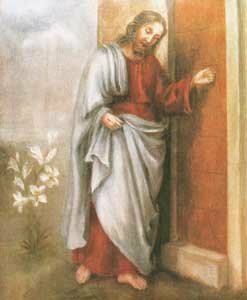 I am heartily sorry for having offended You, and I detest all my sins, because I dread the loss of heaven and the pains of hell, but most of all because they offend You, my God, who are all good and deserving of all my love. I firmly resolve, with the help of Your grace, to confess my sins, to do penance, and to amend my life. Amen. O little martyr of Love, you know now even better than in the days of your pilgrimage that Love embraces all vocations; that it is Love alone which counts, which unites us perfectly to God and conforms our will with His. All you sought on earth was love; to love Jesus as He had never yet been loved. Use your power in heaven to make us love Him. If only we love Him we shall desire to make Him loved by others; we shall pray much for souls. We shall no longer fear death, for it will unite us to Him forever. Obtain for us the grace to do all for the love of God, to give Him pleasure, to love Him so well that He may be pleased with us as He was with you. Intercede for us all the days of our life, but especially during this Novena and obtain for us from God the graces and favors we ask through your intercession. Amen. Thought for the day: Love of God. I will love God alone and will not have the misfortune of attaching myself to creatures, now that my heart perceive what He has in store for those who love Him. What attracts me to the kingdom of Heaven is the call of our Lord, the hope of loving Him as I have so desired and the thought that I shall be able to make Him loved by a great number of souls who will bless Him forever. When Christ said, "Give Me a Drink," it was the love of His poor creatures that He, the Creator of all things, desired. He thirsted for love. Remember that the dear Jesus is there in the tabernacle expressly for you, for you alone. Remember that He is consumed with a desire to come into your heart.